Steve was running the Run to Remember on Sunday, and needed to carbo-load; I was recovering from a wisdom tooth extraction and I decided that risotto counted as a "soft food," so we went to Trattoria Toscana for dinner. The restaurant is often described as a tiny neighborhood gem. It is not far from Fenway Park, so that means you should check the Red Sox schedule and plan accordingly. The restaurant seats less than 30, and is packed during the pre-game hours. Even though the Sox were out of town, we still had a 20 minute wait for a table on a warm Saturday night. I really wanted to like Trattoria Toscana; the room is painted in yellow and gold, evocative of Tuscany, our server was friendly and the prices are extremely affordable. My asparagus and taleggio cheese risotto and Steve's gnocchi were only $16 each. The side of roasted potato was $6. 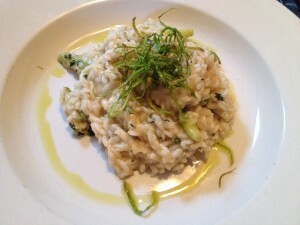 But it always comes down to the food and my risotto was undercooked; the rice still had a hard, uncooked kernel of rice. 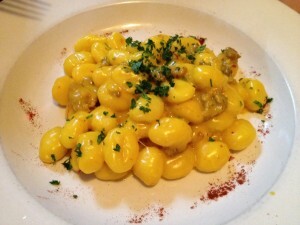 Steve seemed to like his gnocchi; but the sauce was strangely neon yellow (like the cheerful walls) and gloppy. The potatoes were golden, crispy and generously seasoned with rosemary. I think it's a nice restaurant to have down the street, but not worth fighting the crowds and the parking for a special trip.